especially if you are misrepresenting the equipment you are selling. The Jedson brand was actively marketed in the late 1920s to the early 1930s by the John E. Dallas & Sons company in London. The brand disappeared for many years but was resurrected in 1969 by the Dallas Arbiter company. The Jedson brand died again in 1975 when Dallas Arbiter went out of business. This site has become the best place to obtain information about the Jedson brand. It is a collection of information gathered from many sources. The most valuable sources were two catalogs produced by the John E. Dallas & Sons company. Additional information will be added as it is obtained, and corrections will be made as needed. Who was John E. Dallas? John E. Dallas (referred to as JED for the remainder of this document), was born in 1856 in London. JED was a master woodworker who had a deep interest in musical instruments. In 1873 he worked as an apprentice under J.E. Brewser, a master banjo maker in London. Dallas created his own workshop in which he began to make banjos, and formed a new company which continued to grow for many years under the directorship of his sons. JED passed away in 1921; however, the J.E.Dallas & Sons (usually referred to simply as Dallas) continued to produce musical instruments for many years thereafter. Two years after working under J.E. Brewster in 1873, JED began to manufacture banjos in his own workshop for a number of different musical instrument companies in London, England, including Moore and Burgess Minstrels and the Mohawk Minstrels. In 1875 the company John E. Dallas & Sons was born. The brand name Jedson obviously based on the company name. JED had at least four sons, (M.A., C.L., S.J., and E.H. Dallas.) The company was located at 415 Strand Street. J.E.Dallas died in 1921 after which the company became a private limited company although it continued to grow and expand into manufacturing other types of instruments. In 1926 the company relocated to 6-10 Betterton St in London. In addition to making musical instruments, Dallas was involved in printing and publishing music. As the business further expanded, it produced wholesale musical instruments and became a significant importer/exporter. Dallas also manufactured musical instrument strings. In 1930, Dallas marketed instruments under the Jedson and Mastertone brands. The 140 page 1930-31 Jedson and Mastertone catalog contains a wide variety of keyboard, string, woodwind, brass, and percussion instruments, as well as parts and accessories for all kinds of instruments. In 1937 the company moved to Ridgemont Stret in London. The 1938-1939 John E. Dallas & Sons Ltd catalog was only 77 pages! The catalog contained electric guitars branded as Radiotone, and amplifiers under the Ridgmount brand (apparently named after the street on which the facility was located.) The catalog contained a variety of kinds of acoustic guitars from resonators to cello guitars. Dallas imported musical instruments from Germany, Italy, Czechoslovakia, and the USA (including Kay, Harmony, and Vega.) The Radiotone branded guitars appear to have been made in Czechoslovakia, although at least one model branded Radiotone was made by Kay in the USA. Interestingly, the 1938-1939 catalog did not appear to contain the Jedson brand. Per the 1938 catalog, the Dallas Company was located on Ridgmont St in London. In June 1947, John E. Dallas & Sons became a publicly held company. Sometime later the company moved to Clifton Street in London. Due to the impact of World War II in Europe between 1938 and 1945, the company stopped making banjos until 1947 when it began limited manufacturing of inexpensive banjos branded Jedson, but with lesser quality of the pre-war Jedson banjos. In June of that same year (1947), J.E. 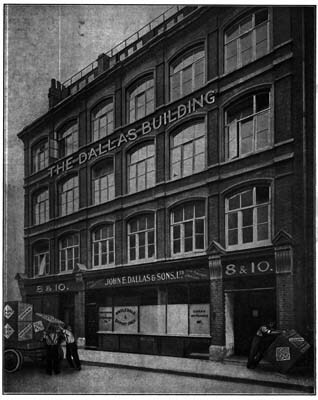 Dallas and Sons Ltd became a public company with an issued share capital of 500,000 GBP. In the 1950s the company began to market electric guitars under the Dallas brand and imported guitars under the Shaftesbury brands. Amplifiers were also added and were sold under the Dallas, Shaftesbury, and Rangemaster brands. In the early 1960s, the company name was changed to Dallas Musical, Ltd at Clifton Street in London, and the products manufactured expanded to include electronic devices. The Houghton Works company facility was closed down and its owner, George Houghton, began to build instruments for Dallas in a new workshop at Bexleyheath, Kent. The banjos were Dallas branded. Dallas Banjo Ukueles were also made at the facility under the direction of George Formby. Ivor Arbiter was another significant figure in the music industry in the 1950s and 60s, even being involved in the success of the Beatles. Arbiter ran a small musical instrument specialty shop named Drum City located at Shaftesbury Avenue in London. A second store was opened named Sound City which specialized in guitars and amplifiers. Eventually the Arbiter-Western company was formed by Ivor Arbiter who served as its deputy chairman. Approximately 1965, Dallas Music, Ltd acquired the company Arbiter-Western (aka Arbiter Electronics?) which was in financial trouble. Shortly thereafter, the company Dallas Arbiter was formed. A branch of the parent company focused on electronic devices such as sound reinforcement equipment, guitar amps and accessories under the brand Arbiter Sound City. For a short time, Dallas Arbiter produced drums, guitars and basses under the Hayman brand. Early guitars distributed by Dallas Music were branded Dallas. A line of imported guitars under the Shaftesbury label were distributed by Dallas Music sometime between 1960 and 1967. Other brands of guitars marketed by Dallas Arbiter including Shergold and Hayman. Dallas-Arbiter also manufactured amplifiers, such as the AC-30 for Vox. Dallas Arbiter is primarily known for its guitar effects pedal known as Fuzz-Face. The pedal was manufactured in the late 1960s and early 1970s; due to popular demand, the pedal was re-introduced in the 1980s. It is no longer manufactured. Ivor Arbiter left Dallas Arbiter in the early 1970s, and formed a new company eventually known as Arbiter AT. Dallas-Arbiter went out of business in 1975. It does not appear that Arbiter AT has any rights to instruments made by Dallas-Arbiter because Dallas-Arbiter was still in business when Ivor Arbiter left the company. Prior to its demise in 1975, Dallas Arbiter imported guitars from Japan under the resurrected Jedson brand. The Japanese guitars were made by several manufacturers including electric guitars by Teisco, and acoustic guitars probably made by Yamaki; although, there at least one other unidentified acoustic guitar maker was involved. Nearly all Jedson guitars were sold in the UK and few are found in the USA. They were all built between 1969 and 1974. The brand's market was primarily students and beginners. The guitars were of high quality but did not have all of the aesthetic details of the parent brand and had a lower grade of hardware including tuners, bridges and tailpieces. During the 1960s and 1970s, Japanese instrument makers were diligently trying to match the quality of instruments made in America such as Fender, Gibson and Martin. Even the entry-level instruments of the time were well made. Acoustic guitars generally had solid wood back, sides, soundboard. The electric guitars used Teisco-made pickups which delivered a unique vintage tone desired by musicians today. Who Manufactured Jedson guitars ? It appears that all of the Jedson acoustic guitars were built in Japan by the Terada Musical Company. The Terada Musical Instrument Company was established in 1912. After World War II, Terada expanded its production of stringed instruments. By the 1960s, Terada was producing more than 10,000 guitars per month in its three Japanese plants. Terada made guitars for well-known brands such as Ibanez, Gibson, and Gretsch. Terada made many acoustic guitars under its own label. Terada-branded models ranged from high-quality entry-level guitars to ornately finished high-end guitars. Terada built guitars for distributers throughout the world. Jedson acoustic guitars were built for Dallas Arbiter by Terada in the late 1960s and early 1970s. Dallas Arbiter failed as a company in 1975 and the production of Jedson-branded acoustics was terminated. All Jedson acoustics have solid spruce tops. Most have rosewood or mahogany sides and back. The 12-string models and the W-130 and 9000 deradnoughts have mahogany backs and sides also. The JW837 has a three-piece back. The F907 appears to be a copy of the well-known Martin 000-28 The JW837 is without a doubt a copy of the famous Gibson SJ-200 Jumbo. The JW837 is a detailed replica from the headstock inlays to the engraved pickguard,to the elaborate bridge, although the Jedson has a three-piece back. Terada models have identical Jedson counterparts. The Terada W180 is similar to the Jedson 9000. All of the Tele models and the semi-hollow and thin-archtop guitars were made by the Teisco Company of Japan. The full-body archtop is virtually identical to the Greco, also made by Teisco. Some believe the Gibson Les Paul copies resemble those made by Tokai. They certainly were made in Japan during the same time-frame as other Tokai built Les Pauls Another source stated that Teisco made a SG model was sold under the Jedson and Kay brands. Teisco was bought by Kawai in 1967. Kawai started to produce all the Teisco guitars, as well as its own brand. The following electric guitar models have been identified and sample photographs are available on this site. By far the most common Jedson electric is the Telecaster-style guitar.